SYDNEY: Australia announced plans Friday to explore concepts such as firing salt into clouds and covering swathes of water with a thin layer of film in a bid to save the embattled Great Barrier Reef, reports AFP. The UNESCO World Heritage-listed reef, about the size of Japan or Italy, is reeling from two straight years of bleaching as sea temperatures rise because of climate change. Experts have warned that the 2,300-kilometre (1,400-mile) long area could have suffered irreparable damage. While the government has pledged to tackle climate change—the greatest threat to the world’s largest living structure—there has also been a push to explore shorter-term measures to buy the reef some time. Canberra in January offered Aus$2.0 million (US$1.5 million) to attract innovative ideas to protect the site, which is also under pressure from farming runoff, development and the predatory crown-of-thorns starfish. Six schemes selected out of a total of 69 submissions will be tested to see if they are feasible. One selected concept is cloud brightening where salt crystals harvested from seawater are fired into clouds, making them more reflective and therefore deflecting solar rays back into space. David Mead, a researcher at the Australian Institute of Marine Science, said the idea might seem wacky but the proposal has real potential. “The team have been looking at using a very fine nozzle to pump small droplets of salt water at the rate of several billion per second,” he told national broadcaster ABC. 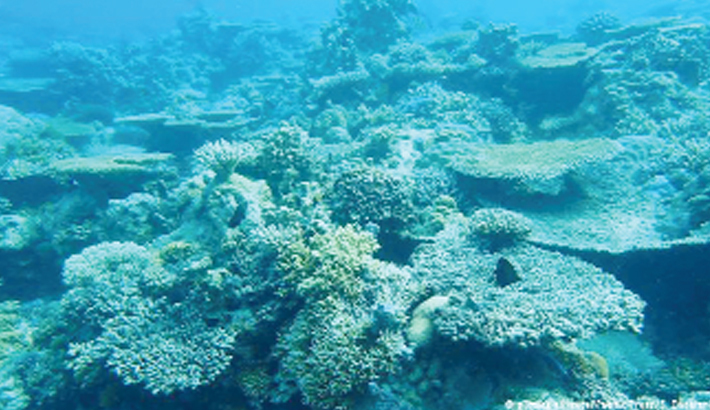 Another idea was a biodegradable “sun shield”, where an ultra-thin film containing light-reflecting particles covers some reef waters to protect corals from heat stress. “The great thing about the film is it is only a molecule thick so you can swim straight through it and it’ll just keep self-forming,” Andrew Negri from the Australian Institute of Marine Science told the ABC. Other short-listed projects include mass producing coral larvae with the aid of 3D-printed surfaces to support new growth, and large-scale harvesting and relocation of larvae. The experimental commissions came as Canberra said Friday it was updating its Aus$2.0 billion “Reef 2050” plan—first unveiled in 2015 — to protect the reef, with further measures to improve water quality.